How can funders bring about positive social change? Does ‘Funder Plus’ add value or is it more trouble than it’s worth? Does working in collaboration with each other make funders more effective? Is it better for a funder to address immediate needs or instead try and achieve systemic change? What is the appropriate role of the funder in society? Is it legitimate for funders to be directly involved in campaigns to address what they have identified as problems in society? To what degree does a funder need to be a specialist in the areas they fund in? How many areas can a funder be involved in and still remain effective. How should a funder go about deciding which organisations to fund, through an open application process or through proactive selection? And so on. As we explored these questions with a wide range of funders, philanthropists, grantees and commentators we noticed a couple of patterns emerging. Firstly, people nearly always prefaced their comments by saying something like, “Well it depends what sort of funder we are talking about” or “It varies according to the context”. Secondly, when asked to describe their own response to a particular question, funders were reticent about saying this is the way it should be done, preferring to talk about a range of possible approaches and the case for a mixed economy. In fact the word that a lot of people used was ‘spectrum’. In the recent series of debates and workshops in which we began to present our findings, a number of funders have recognised this framework as a tool which could be useful in the process of thinking about their own approach to funding, particularly in relation to achieving as much clarity and intentionality as possible in their work, as I discussed in my last entry. 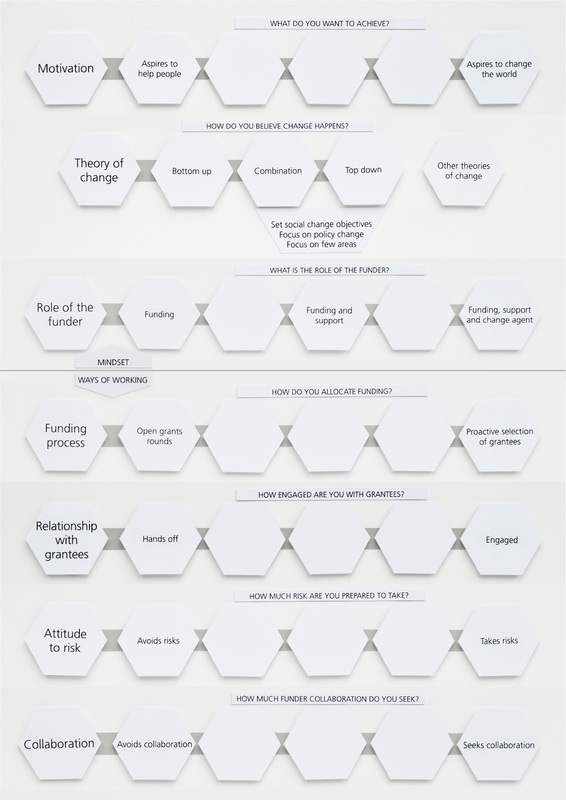 We will soon be publishing other tools to complement the Funder Spectrum Framework, which we hope will similarly prove helpful to funders grappling with the many complex questions and dilemmas which face them in their work. If you have any thoughts on the topics covered please contact Dörte Pommerening. If you would like to contact the Fund about their work please contact Andrew Cooper.